InfoStructures, Inc. is pleased to announce that we have been awarded an Indefinite-Delivery, Indefinite-Quantity (IDIQ) Multiple-Award Contract (MAC) with the Seaport Enhanced (SeaPort-e) contract vehicle as of November 19, 2013. This win significantly increases opportunities for InfoStructures to provide Engineering, Technical, and Programmatic Support Services to the Naval Sea Systems Command, Naval Air Systems Command, Space and Naval Warfare Systems Command, Naval Supply Systems Command, Military Sealift Command, Naval Facilities Command, Strategic Systems Programs, Office of Naval Research, Defense Threat Reduction Agency, and the U.S. Marine Corps. Under Seaport-E, InfoStructures will be able to bid on solicitations issued under full and open competition as well as those set aside for small business in the 22 functional service areas that fall within the scope of the contract. The Government estimates a maximum of $5,300,000,000 of services will be procured per year via orders issued under the SeaPort-e multiple award contracts. While InfoStructures received this initial award without additional team members, InfoStructures does anticipate expanding our SeaPort-e team in the future as we pursue key opportunities within the Department of the Navy. Please email SeaportInfo@infostructures.com or call 301.417.7171 for more information. InfoStructures’ quality assurance program is integrated at the deepest levels into all our service delivery operations. It incorporates multiple personnel and optimized procedures to ensure the highest-quality service delivery throughout the entire Task Order cycle. The participation of a Quality Assurance Manager (QAM) is integrated into every Task Order. The QAM works with our Service Delivery Manager and the Program/Project Manager not only initially, but throughout the performance of the Task Order on Quality Management Activities. InfoStructures’ bottom-up approach to quality control of projects and task management includes forward-planning methodologies, proactive task planning and monitoring. This approach anticipates future task order requirements, significantly reduces schedule and fiscal risk, and provides efficiency in the delivery of all products and services. Our task assignment and monitoring procedures are designed to reduce uncertainty, provide a continual source of quantifiable performance measurement data, and ensure that this information is constantly relayed to the COR or his/her designated representative. We apply best practices as well as InfoStructures’ own standard operating procedures (SOPs), and other quality improvement initiatives as appropriate. We use a continuous process improvement methodology, Design-Execute-Review-Refine methodology, on every project and task. 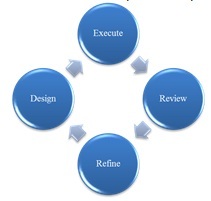 This methodology ensures continued process improvement by providing for: Design-Execute-Review-Refine methodology.